Due to tidal actions, sediment that accumulated from runoff from the uplands and nearby construction of the Kawaihae Harbor, this submerged heiau has never been located or documented through underwater archaeology – however, folklore suggests it existed and was dedicated to the shark gods. Per Pukui, ʻaumākua are family or personal gods, deified ancestors who might assume the shape of the animal, plant or other feature they represent. One early account said that King Kamehameha sat there while his staff compiled the tally of the latest fishing expeditions, and that somewhere near the stone might have been the spot of Keōua’s death. Apple notes that catching sharks was a sport indulged in by high chiefs and conjectured that perhaps the animals were conditioned to rotten flesh in the offshore temple so that they could be enticed with it into the deeper water and easily noosed. Today, this area is known to be frequented by sharks. In the early morning hours, you can usually see the sharks plying the waters just offshore, near where the heiau is believed to be located. 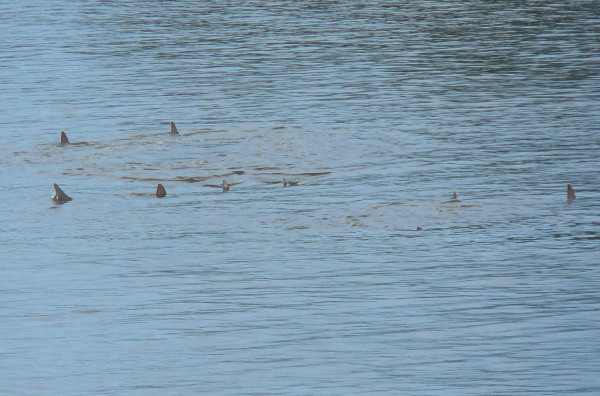 The image shows sharks at this same location on December 3, 1012 (Pacific Island Ranger.) In addition, I have added other images in a folder of like name in the Photos section on my Facebook and Google+ pages.